The origins and early location of Belozersk, a town of some 10,000 souls in the Vologda region, are dim and uncertain, but “Beloozero” is considered among the oldest recorded settlements among the eastern Slavs, mentioned in the Primary Chronicle under the year 862 as one of the five towns granted to the Varangian (or Viking) brothers Riurik, Sineus and Truvor who, according to the Chronicle, were invited to rule over the eastern Slavs in what was then called Rus’. Whatever the details of its history, it is clear from the name that the town was always closely connected with White Lake (Beloe Ozero), a large body of fresh water in northwestern Russia. Although smaller than Lakes Ladoga and Onega, White Lake is a pivotal link between those two lakes and the Russian heartland. On the southeast end, White Lake drains into the Sheksna, a tributary of the Volga and the route of many summer cruise boats between Moscow and St. Petersburg. The early Beloozero was at a different location on White Lake, and the town was resettled more than once before settling in its current location in the late 14th century. As Moscow’s power increased in the 15th century, Beloozero gained strategic importance as a bulwark on Muscovy’s northwestern frontier and its water transportation routes. Ivan III (the Great) understood the significance of this location, and in 1487 he constructed a large fortress, or kremlin, whose earthen ramparts still stand. The town prospered during the middle of the 16th century, particularly as a source of iron goods and fish. An impressive visible reminder of that wealth is the fortress-like Church of the Dormition, begun in 1553 on one of the town’s highest points. Beloozero witnessed the disruptions of the latter part of the reign of Ivan the Terrible (r. 1547-84), when the town was included in his personal domain and served as a place of exile. The inclusion of Beloozero in Ivan’s domains did not prevent it from experiencing the famine and disease inflicted on much of the rest of Russia in the late 16th century. And in 1612, the town was completely sacked by a marauding force. With the revival of trade in the 17th century, Beloozero’s location and natural resources again proved advantageous. The Cathedral of the Transfiguration was built in the 1670s, during the reign of Tsar Alexei Mikhailovich. With the founding of St. Petersburg in 1703, Beloozero found itself in a pivotal position between the Volga River Basin and the large northwestern lakes that led to the new imperial capital via the Neva River. In 1777, the town’s name was formally changed to Belozersk, and the next year it gained a new plan as part of Catherine the Great’s project to remake Russian provincial life by redesigning regional centers. In the case of Belozersk, the natural landscape and the design process were successfully united. A terrace effect created by the gentle slope of the town toward the lake to the north was utilized to create a leafy boulevard (now called Soviet Prospekt) parallel to the lakeshore. The boulevard was flanked by other east-west streets, which were in turn intersected with a system of north-south lanes leading to the lake. This design was dominated in the west by the high earthen walls of the kremlin, while small hills with churches anchored the south side. Despite the vandalism inflicted on these churches in the Soviet period, Belozersk’s remoteness from economic development has preserved much of its center with 19th century buildings. The best general view of historic Belozersk is provided by the ramparts of the kremlin. This citadel is perhaps the best-preserved example of a type of earthen fortress once widespread among the eastern Slavs. Roughly quadrilateral in shape, the fortress was protected on two sides by a moat. In the late 17th century, the ramparts were still surmounted with a log wall containing eight towers and two gates, although these were all removed in the 18th century. Apart from the historical significance of the fortress, its high ramparts offer breathtaking views of the town and of White Lake. Although Belozersk is distantly visible from summer cruise boats, very few of them dock there. 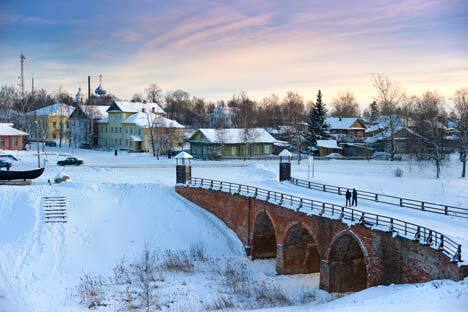 The best way to explore the town is by car from Vologda, an option that also allows a trip to nearby Kirillov, with its monumental Kirill-Belozersky Monastery—all relics of the rich history of the Russian north.